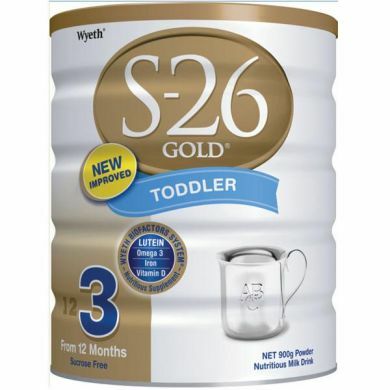 S-26 GOLD TODDLER, with the Wyeth Biofactors System, is a nutritious milk drink that helps support a toddler's cognitive, visual and physical development. This helps feed a toddler's potential from head to toe. Maltodextrin; non-fat milk powder; vegetable oils [soybean, oleic (safflower or sunflower), palm]; whey protein concentrate; sucrose; emulsifiers (soy lecithin, monoglycerides); ethyl vanillin; long chain polyunsaturated fatty acids from single-cell sources (arachidonic acid (AA), docosahexaenoic acid (DHA); antioxidants (mixed tocopherols concentrate, ascorbyl palmitate). Potassium hydroxide; potassium chloride; sodium bicarbonate; ferrous sulphate; potassium bicarbonate; zinc sulphate; manganese sulphate; copper sulphate; potassium iodide. Vitamin C; niacin; vitamin E; thiamin hydrochloride; vitamin B6; vitamin A palmitate; calcium pantothenate; natural carotenes; riboflavin, vitamin K; folic acid; biotin; vitamin D3.